Self-driving cars are approaching quickly. 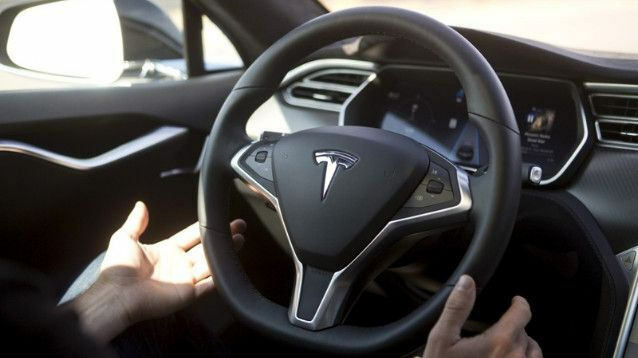 Google unveiled its self-driving project just four years ago, while Tesla shipped the first car with its famous auto-pilot feature just one year ago. Though impressive progress has been made, much more is needed before self-driving cars reach scale. In the meantime, there have been setbacks. Last May, the first person was killed in a car operating on auto-pilot, while Uber ended its San Francisco self-driving project after a week amid permit conflicts with the DMV, along with several sightings of its cars running red lights. (The project continues in Arizona.) Despite the inevitable bumps along the way, self-driving cars—also known as “autonomous vehicles”—will almost certainly become a reality within the next two decades, and their impact will be felt massively across the transportation and logistics industries, among others. 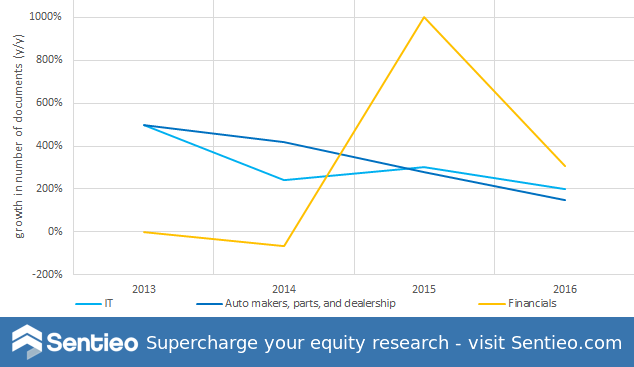 A search for “autonomous car,” “autonomous vehicle,” and “self-driving car” on Sentieo Document Search, shows that the number of references to self-driving cars is booming. 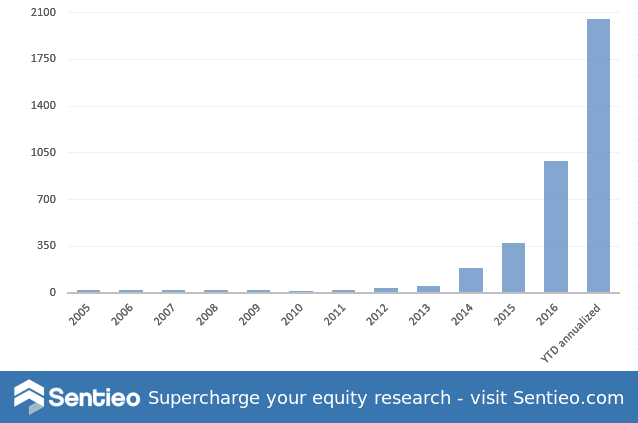 The graph below shows the number of company press releases, presentations, filings, and broker research reports which mention these terms dating back to 2005. Though interest began appearing that year, mentions only started to gain pace in 2012. They took off in 2014 as the topic went from theory to reality. The search terms were mentioned in over 140 documents in January 2017 alone. Growth in mentions between 2014 and 2016 represent an increase of 850%. 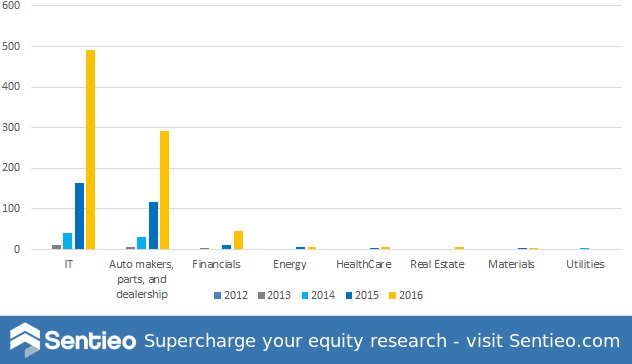 We expect the number of references to more than double in 2017 based on early data. If self-driving cars turn out to be as impactful as the proliferation of smartphones following the iPhone debut in 2007, there is still an enormous amount of room for growth. The graph below shows the monthly occurrences of documents mentioning “smartphone” and related terms since 2005 in Sentieo’s Document Search database. The first time “smartphone” appeared in 140 documents in a month, matching the current peak levels for self-driving cars, was in May 2009. The theme grew considerably afterwards and peaked seven years later in May 2016 with 4,404 documents, representing 32x growth over seven years. Shares of Apple rose 660% over that period while those of Nokia fell by 62%. 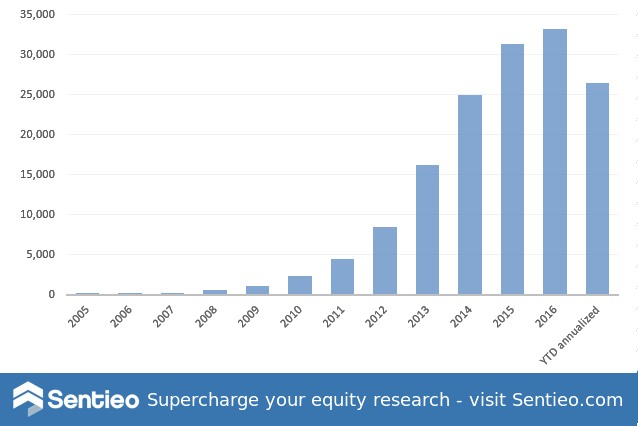 If the smartphone cycle is any indication of how long and deep a successful cycle can be, there is still much more to come with self-driving cars, and many more opportunities to play the theme on the equity market. Mentions of self-driving cars level off significantly outside of the tech and automotive industries, but one sector is starting to show notable interest: finance. 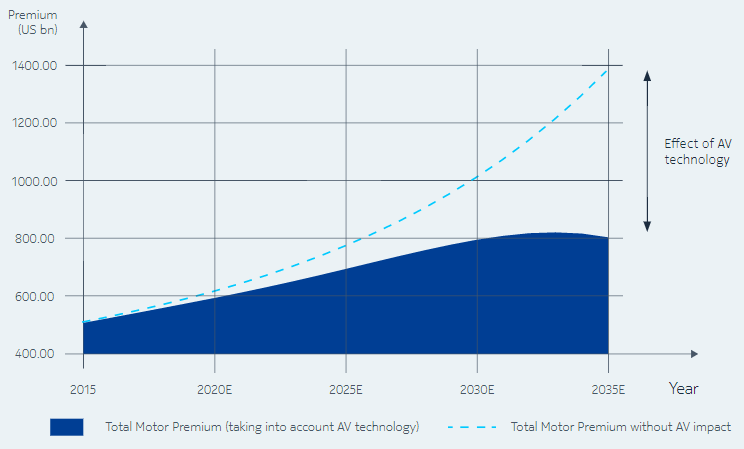 Insurers, which will be impacted heavily in the auto insurance industry, are responsible for this growth. As shown in the graph above, the number of mentions of self-driving cars in the financial sector is now higher than it was for tech and automotive in 2014, the year that Mobileye went public and car vendors began selling vehicles with advanced driver-assistance features. The timing of the uptick also matches the launch of Auto-Pilot by Tesla, which has prompted the insurance industry to assess the potential impact self-driving cars will have on its business model.